City Hall intends to be stricter with regards to its tax collection approaches. High on the list of measures that it will take to ensure taxes are paid diligently is the plan to take tax defaulters to court for what is owed, since the City is owed billions in taxes. Acting Town Clerk, Sharon Harry-Munroe, indicated that persons who are not paying their taxes will not be given the same amount of leniency that they have been bestowed in the past. “From the notices that we have served, we have had a good response, so we would not have taken any directly as yet, but we [have a list]” of about 20-30 persons to date, who have received. 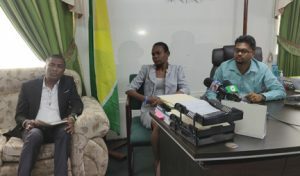 From left, Deputy Mayor Alfred Mentore, Acting Town Clerk, Sharon Harry-Munroe and Mayor Ubraj Narine. on methods to garner monies to help offset expenses the council is currently facing. In the report prepared by retired Justice Cecil Kennard, the City was encouraged to review tax collection methods such as the granting of amnesty to defaulting ratepayers. In fact, the report said that granting of amnesty is one which opens the floodgates for corruption. Mayor Ubraj Narine said that it is important for all Georgetown businesses to pay up their taxes, because City Hall will not be able to afford all of the expenses necessary to manage the city. In addition to millions owed to several agencies and individuals, the CoI had found that the Mayor and City Council racked up over $206M in debt to the National Insurance Scheme. The new administration of the Mayor and City Council has acknowledged that it inherited an organization riddled with allegations of corruption and mismanagement as well as lack of transparency, and has committed to mitigating those problems.